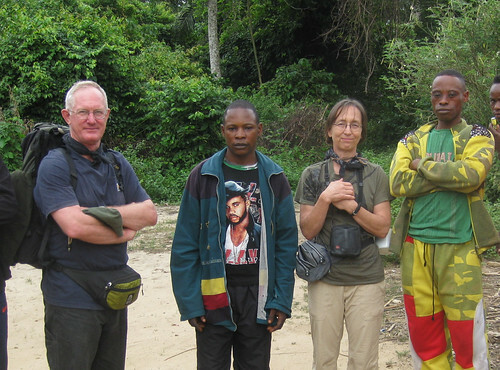 Searching for Bonobo in Congo » Congo Tourism 4 : Dugout, Moto-bike, and Hiking-boot to Camp Bonobo. « Off Track Towards Congo’s Future: the Train. Our trip had an element of Robin Hood and the merry men marching through Sherwood forest. I prefer that image to the image of missionaries for conservation. 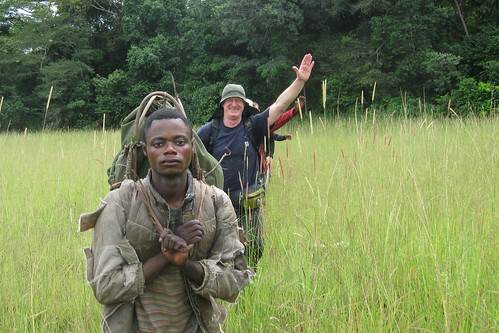 Or was I just accompanying John on his way out to Camp Bonobo so that I could see our teams and the Bangengele of Tshombe Kilima. In any case, we traveled 370 km (230 miles) round trip of which more than 80km (50miles) were on foot . We saw beautiful forest, and, yes, we did preach conservation. That was an important part of the trip. Our teams are following the bonobos in the Bangengele forests. 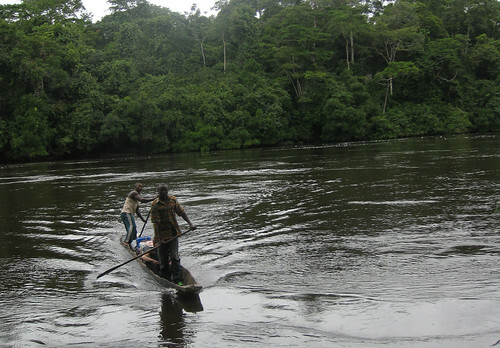 The forests are hunted for the bushmeat trade; bonobos, too, are hunted. One of our people was nearly shot when a hunter came on the study area. We need the help of the Bangengele ethnic group and the Bangengele need our help or their forests will be empty of large animals in ten years. 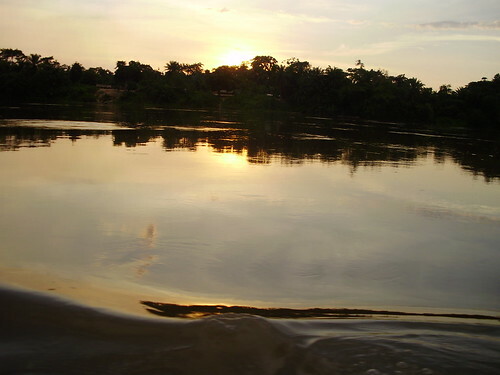 27 March 09 – We took off from Kindu on Friday night. It took a while to load our moto-bikes into the dugout. By the time we pushed off from the port the ferry-dugouts were shuttling people home across the Lualaba from Kindu-center. We were going north, downstream, into the night. 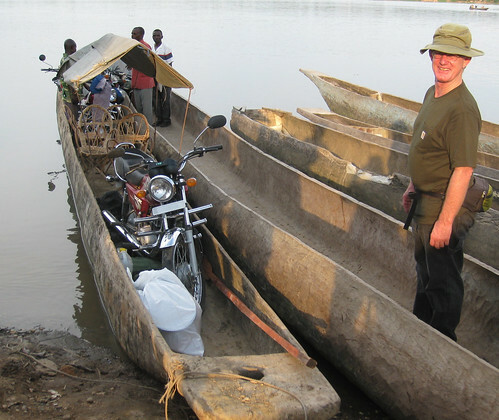 John overseeing the loading of the dugout in the Lualaba’s Kindu port. 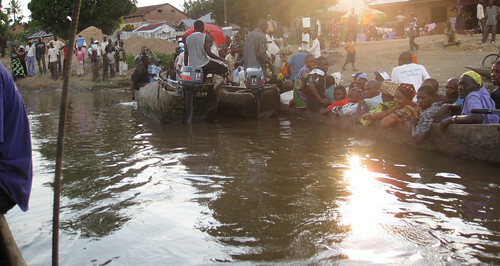 We pulled out from the Kindu port in the late afternoon as the dugout-ferries were crossing people back to their homes on the opposite bank. We were heading north into the night and towards the old Arab port of RibaRiba (now Lokando). 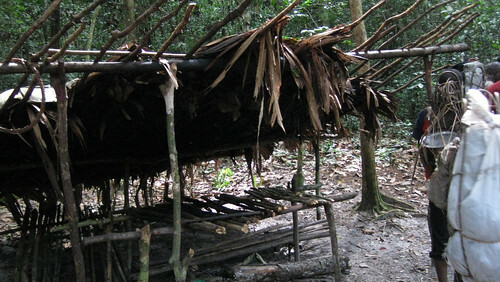 28 March 09 – We broke camp in the village of Lokando and traveled west across forest. The narrow dirt track was barely practicable by bicyle and moto-bike and only for 70km, as far as Tshombe Kilima . This is a principal track for bushmeat transporters heading towards Kindu. Not maintained since colonial times, the road’s bridges are minimally functional. 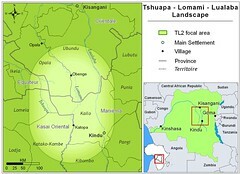 29 March 09 – We slept in Tshombe Kilma, a village of the Bangengele ethnic group. This is an important village. 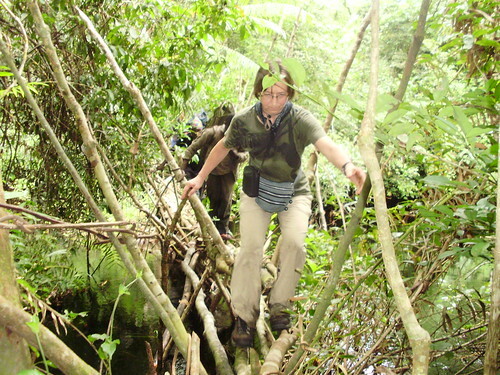 Bonobo-rich forest is part of the village’s traditional lands. Last year, John came to talk to them about the dangers of market hunting and he was threatened with sorcery. Dino camped here when inventorying animals, and was arrested and held for a week. We hoped to take off very early Sunday morning and were up before dawn, but the village wanted to talk. There was disagreement. The bushmeat traffickers were not happy. We did not get off until 9 o’clock. 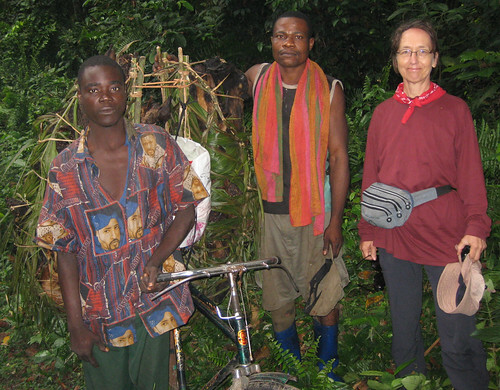 We arrived on the banks of the Lomami an hour after dark, by head-lamp. Above, the morning village-dialogue. Below, a video of the same discussion. All discussion was in Swahili/Kingwana. This village does not even have an elementary school and the closest is nearly 50 km away. Very few people could speak any French (national language) at all. This elder is explaining how hunting seasons worked during colonial times. 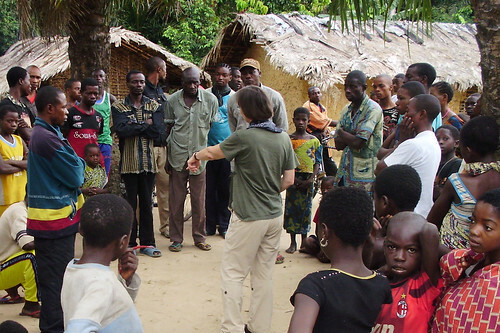 Among the listeners are two uneasy bushmeat traders: the woman with her hair in a net and the man in a hat next to the elder. We felt like we were making progress. The chief of Oleke (in center) accompanied us to the edge of town along with the uncle (in yellow) of the TshombeKilima boy-chief. This uncle threatened John with poisoned arrows on his first trip. We started across the first savanna-island in high spirits, but these are punishing, hummocky-flooded environments (even if botanically fascinating). In all, we slogged across them for at least three hours total. The remaining eight hours were through beautiful forest. The largest river, the Loidjo, we crossed on a liane bridge our own teams had previously slung together, the rest of the swamps and streams we crossed on logs or wading. 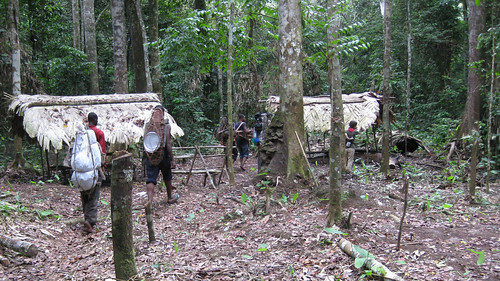 30 March 09 – I spent only a day in the base camp at Katopa (more about the doings of the teams in upcoming posts). I talked to most of the team leaders. Only Dino was not there. He was on mission down the Lomami. 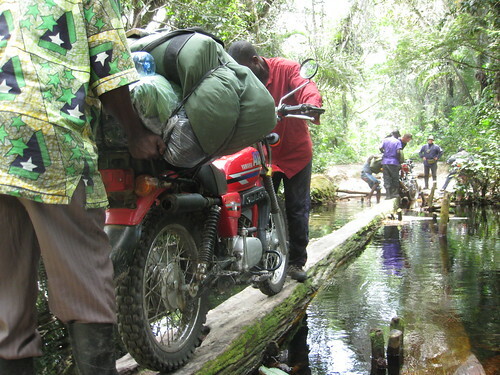 Crossing the Lomami to our Katopa base camp. A powerful river, excellent oarsmen. We did this after dark on 29 March. 31 March 09 – Said goodbye to John and left at first light. On the way back , in the light of morning, we could see the study area, Camp Bonobo, and what was left of the tree that fell across camp (they had burned most of it) . We also saw a hunting camp just beyond the study area. Hiking through Camp Bonobo on the way back. The burned stump is just ahead of me, next to the second shelter. Hunting camp near study area. 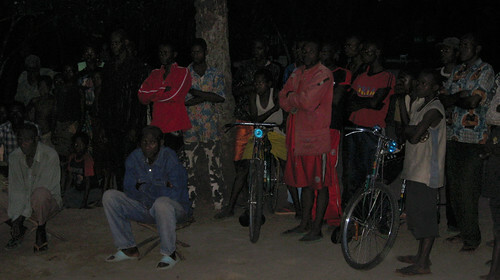 That evening when we got back into Tshombe Kilima more talks were necessary. 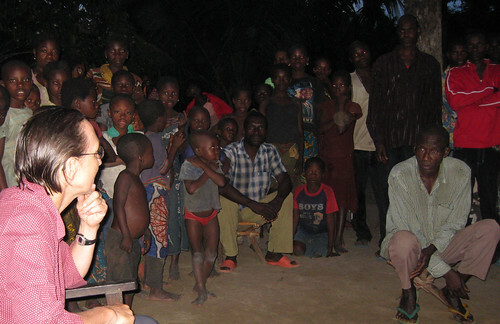 It was night when the villages of Tshombe Kilima and Oleke gathered by a single lantern, I had just taken a bucket bath and was more than a little tired. But all the grown men of the two villages, many of the women and herds of children gathered. Talking about protected species, hunting seasons, protected areas. A big turn-out of the Bangengele. There is a slowly growing consensus. Officially protected species (elephant, bonobo, red colobus ..etc) should not be hunted. There should again be hunting seasons during which the forest is “quiet” and animals can reproduce. And yes, maybe, just maybe, there should be a protected area in these the Bangengele forests. This entry was written by Terese Hart, posted on 2009-04-05 at 1:49 pm, filed under About the project, Bonobo, Bushmeat, Kindu. Bookmark the permalink. Follow any comments here with the RSS feed for this post. Post a comment or leave a trackback: Trackback URL.